Import of the Veda has been a matter of great curiosity ever since its inception millennia back, the Vedic seer himself having characterized it as secret words, ninya vacamsi. This curiosity has become all the more enhanced and universalized in the modern times with the failure of science to provide suitable answer to the basic problems of mankind, that is peace, harmony and satisfaction in life. 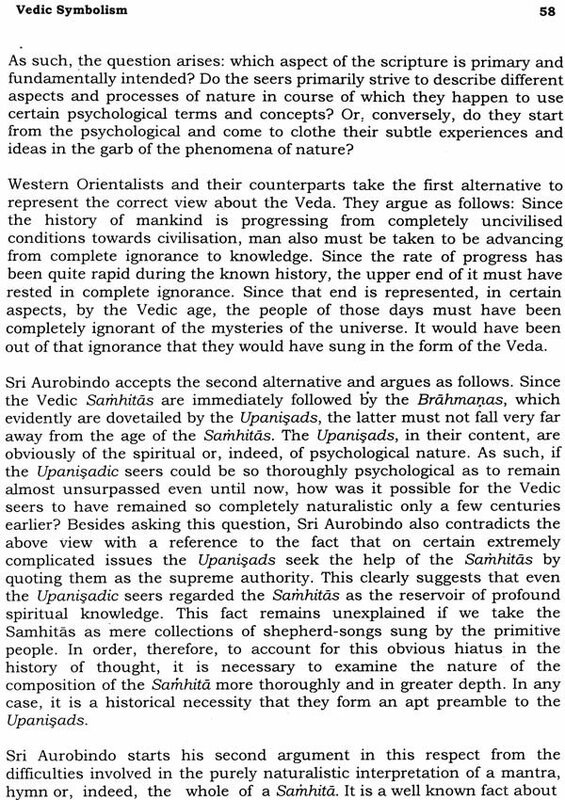 The higher intelligentsia once again, therefore, is turning back to the Veda, the oldest literary heritage of mankind having embedded in it the wisdom of ancient seers and sages supposed to have seen across the total span of the reality. But in the absence of a proper clue to get unfolded this ancient deposit of wisdom, all the expectations from the Veda have remained unfulfilled so far and have got rather blurred by the misinterpretations of the typical modern scholarship in the area. 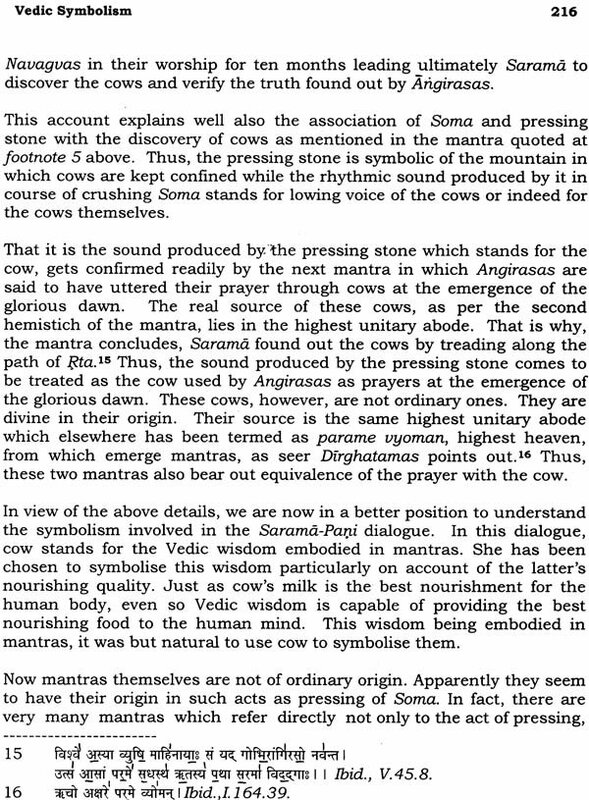 Vedic Symbolism is not only a befitting answer to all such misrepresentations but also the key to unlocking the secret of the Veda most authoritatively, having been forged out by a seasoned Vedic scholar of the eminence of Prof. S.P. Singh. Here is a tool made available in a profound way to unlock the secret of the Veda at its best to quench the thirst of the inquisitive to know what Veda really is. 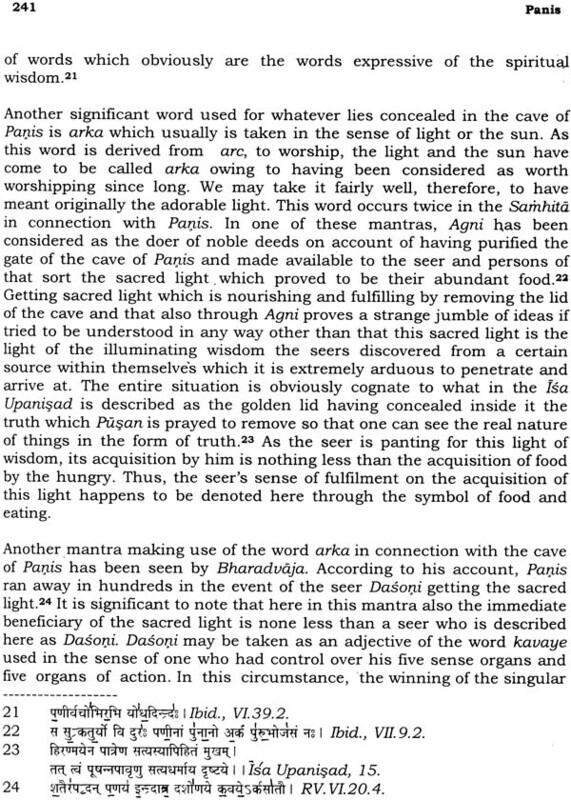 The validity of Vedic Symbolism has already been attested and established through its presentation in the Worshops organized successively for two years in December 1998 and 1999 under the aegis of the Maharshi Sandipani Rashtriya Veda Vidya Pratisthan and attended by the select gathering of Professors, Readers, Lecturers and Research Scholars of the Universities of Delhi besides highly knowledgeable persons drawn from other areas of understanding, The Maharshi sandipani Rashtriya Veda Vidya Pratishthan has under taken to publish the work so promptly at the constant insistence of these learned persons. The Pratisthan would feel gratified only if this latest and most ambitious projection of it gets matching response from the intelligentsia of the country as well as abroad curious to get to the real content of the richest heritage of mankind bequeathed to it by seers who had got so elevated in their consciousness even at that stage of human history as to think of the whole world as a nest, yatra visvam bhavaty ekaneedam, and of all expositions of truth as referent to one and the same Reality, ekam sad vipra bhaudha vadanti. That the Vedic language is symbolic has been recognised throughout the long history of development of the Vedic knowledge. 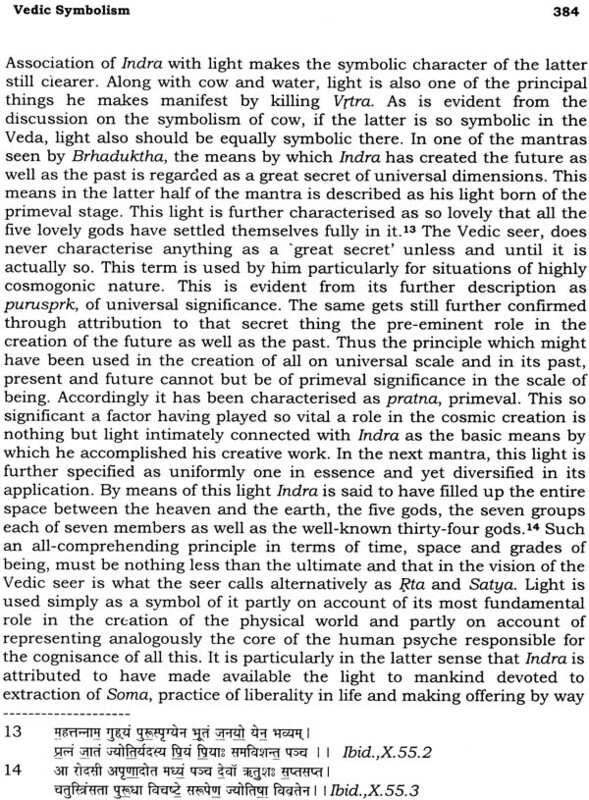 The Vedic symbolism continued to be used to a considerable degree in the Upanishads. The spirit of symbolism is constantly alive in the Puranic and Tantric literature. 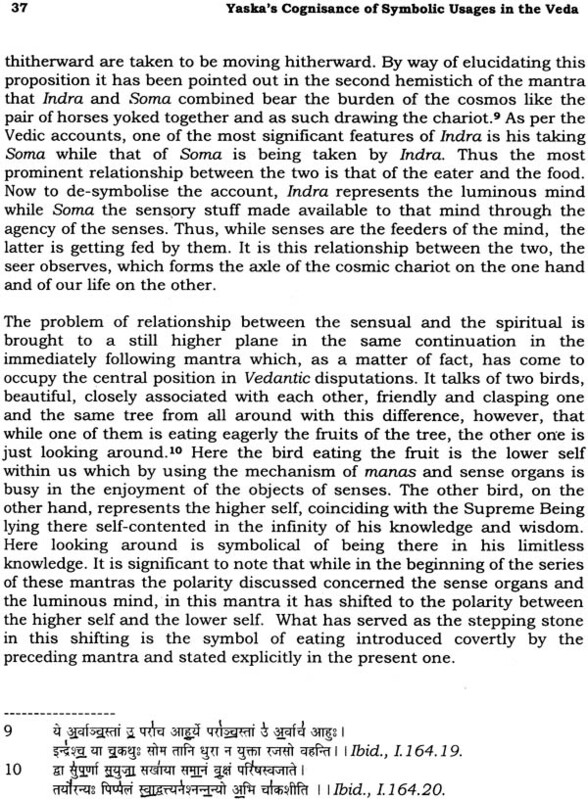 Vaishnavite poetry, too, bristles in symbolism. The important question, however, pertains to values of symbols used in this great Vedic tradition, and these values can be meaningfully uncovered only if the symbols used in the Veda are correctly unveiled. 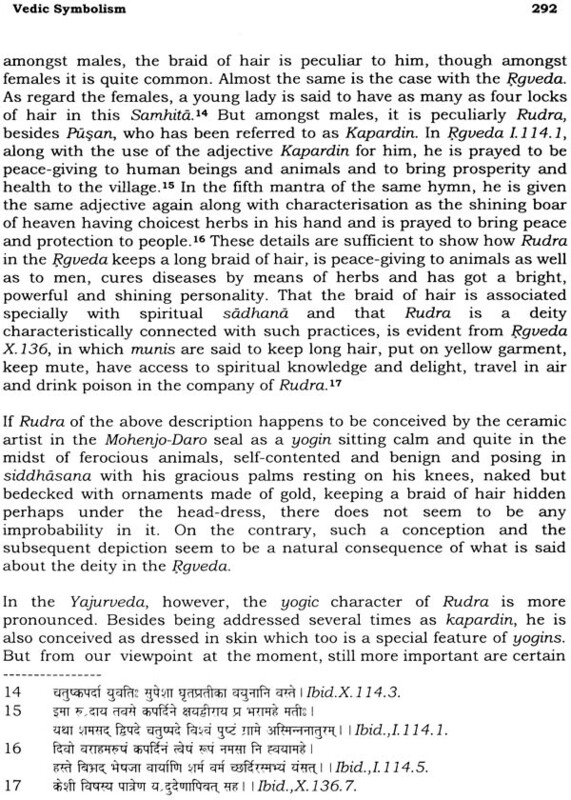 This is a very difficult task, particularly because we are today very much removed from the modes of Vedic thought, while preponderance of the ritualistic interpretation of the Veda has tended to weaken our occult and spiritual sensibility, which is of supreme importance for getting to the heart of the Vedic hymns and their symbolism. 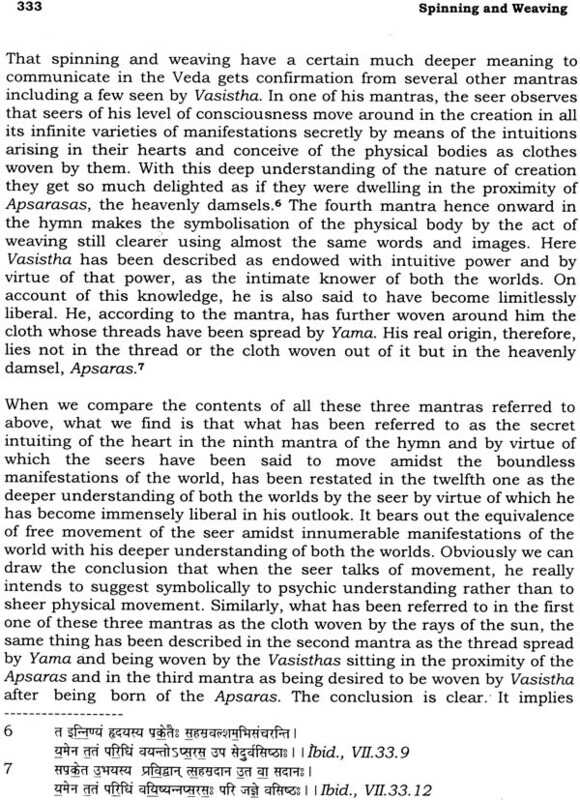 Vamadeva, whom the fourth mandala of the Rigveda is devoted to, declares that Vedic words are secret words and revealthemselves only to seers . These secret words are, however, not entirely secret, and the veil that they cast is not always thick; their transparency is often decipherable, and in the hands of the seers they reveal their secret, just as, -- to use the Vedic expression --, the woman reveals herself to her husband. It is because of this reason that the task of unveiling the secrecy of the Vedic symbolism is not as impossible as it might seem. Nonetheless, the task is very difficult and painstaking labour has to be coupled with occult and spiritual sensibility. It is against this background that Professor S.P. Singh's vast and meticulous labour in undertaking the task of uncovering the Vedic symbols is to be appreciated. He is one of the rarest scholars of India whose knowledge of Sanskrit and of the Vedic Samhitas is so intimate that he is today the most qualified scholar to speak to us of Vedic symbolism and its secrets. In conducting his research work, he has happily discovered that the light that Sri Aurobindo has shed on the secret of the Veda is an indispensable aid. As is well known, Sri Aurobindo has presented a psychological theory of the Veda in the light of his own spiritual experiences, and the Vedic knowledge that he has brought out has been expounded in two of his major works, "The Secret of the Veda" and "Hymns to the Mystic Fire". He has also employed this knowledge in his interpretation of the Ishopanishad and Kenopanishad. 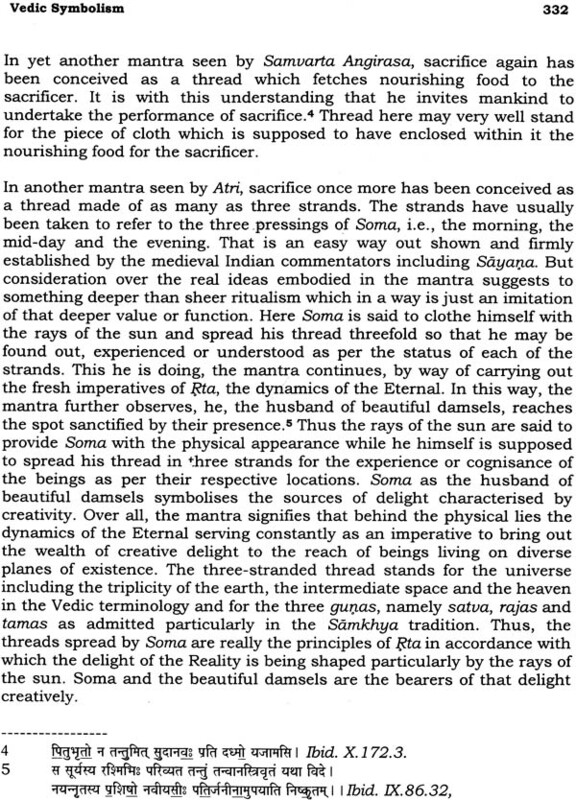 Indeed, Sri Aurobindo's magnum opus "The Life Divine" as also his other works such as "The Synthesis of Yoga", and "The Essays on the Gita" bear the impress of his discovery of the secret of Vedic symbolism. Professor S.P. Singh has been a life-long student of Sri Aurobindo's works, and his expert knowledge of Sri Aurobindo's philosophy and Yoga is evident in his earlier works on the Upanishads and his comparative studies of Jung and Sri Aurobindo, as also Whitehead and Sri Aurobindo. It is gratifying that it was at my request that Professor S.P. Singh undertook five years ago to conduct the research work that has resulted in this voluminous book. 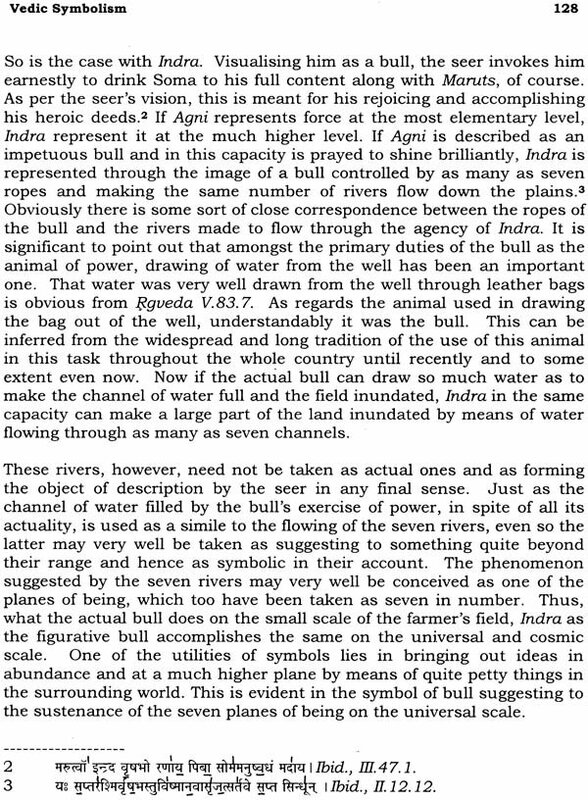 The first half of the Vedic Symbolism has been devoted mainly to determination of precise symbolic meaning of gross earthly objects used frequently in Veda such as cow, bull, ghrta, horse, chariot, boat, path, cave, etc. 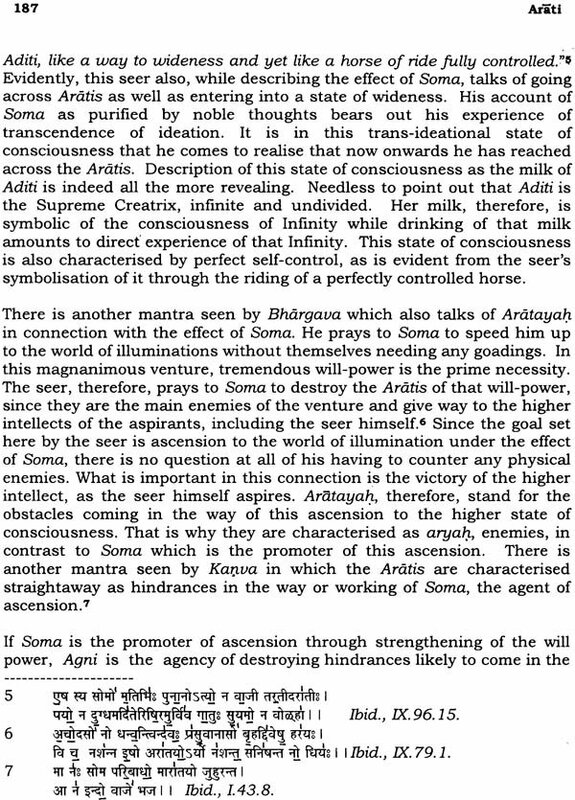 while in the second half the same has been done in regard to certain functions, abstract objects, principles and practices such as initiation, spinning and weaving, askesis, sacrifice, Vak, Pranava, Sarasvati and ventures of the most primeval seer Angiras in the realm of the knowledge of the reality. The meaning behind the symbols has been determined on the basis of sufficient evidence and with utmost care and precision. 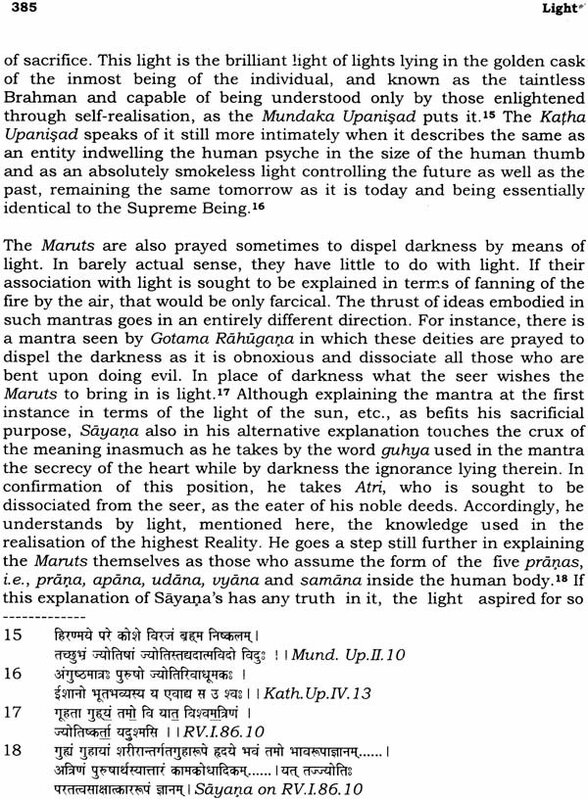 The basic tool that has been forged out and used in this regard is the use of simile and metaphor in the mantras. Simile and metaphor have been taken as the primary and secondary stages in the formation of the symbol which emerges as culmination of the process. Having been worked out on this solid basis, nothing arbitrary has been allowed to creep into this study which is intended to be made as precise and objective as possible. The study of Professor S.P. Singh has led to certain conclusions, main Gross physical objects have been used in the Veda in some or the other secondary sense and scarcely in the primary sense. Such usage is obviously symbolic. Symbolism is the transference of the signification of a word from the basic to a secondary order of things or ideas. 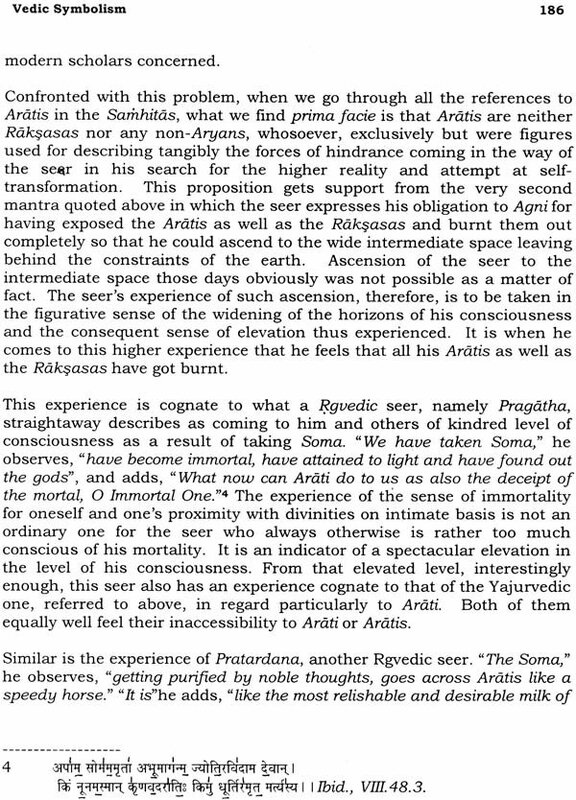 The basic idea Vedic seers have intended to convey is of spiritual and deep psychological nature which is the result of their intensive search, contemplation and askesis. 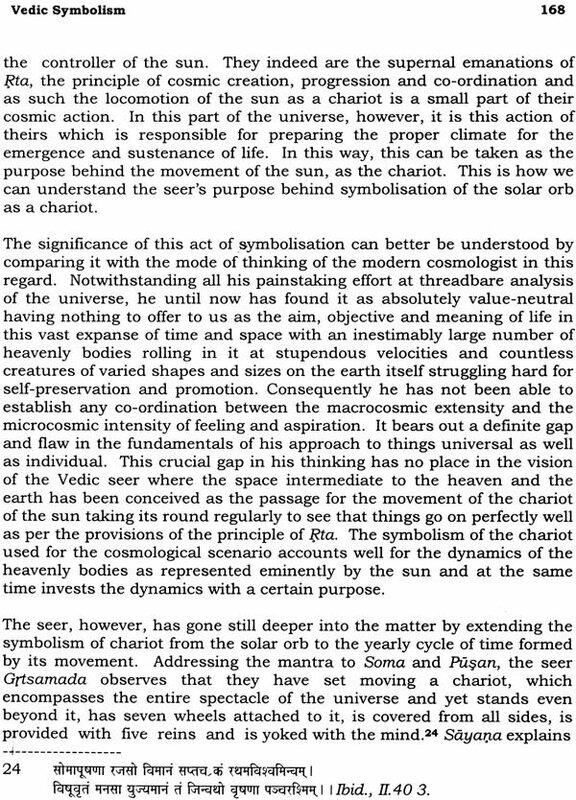 The objects, events and processes the seers have adduced for the expression of these ideas have been taken from their surroundings some times in their existing forms and at others in modified forms so as to suit the requirement of expression. Stock example is the bull with four horns, three feet, two heads and seven hands. The manifest content or symbol in the Veda has acquired its sanctity in the tradition owing to its association with noble ideas expressed through it as well as to their practical utility in the lives of the discoverers of those ideas. 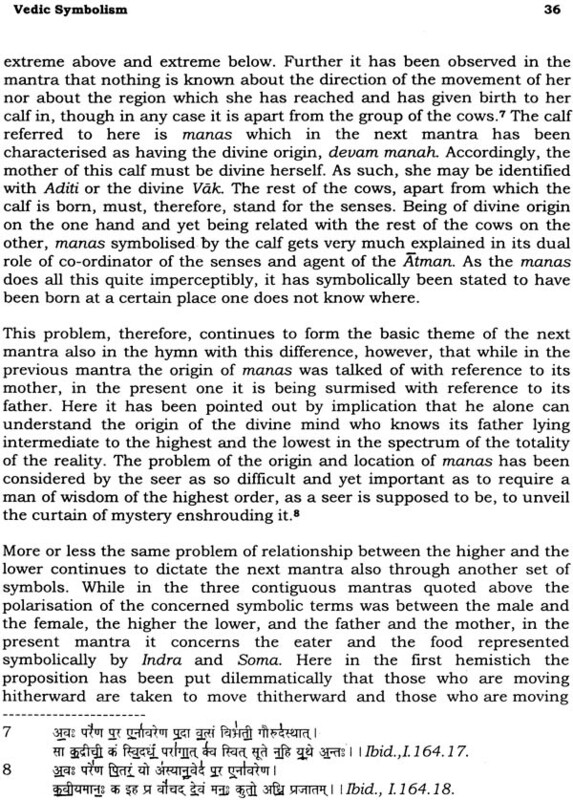 Thus the theory of triple meaning of Vedic mantras has come to be redefined in the "Vedic Symbolism" in terms of primacy of the spiritual and secondary character of the physical and the mythical. This accomplishment brings coherence to the meaning of mantras in place of triplicity and the consequent incoherence and uncertainty. 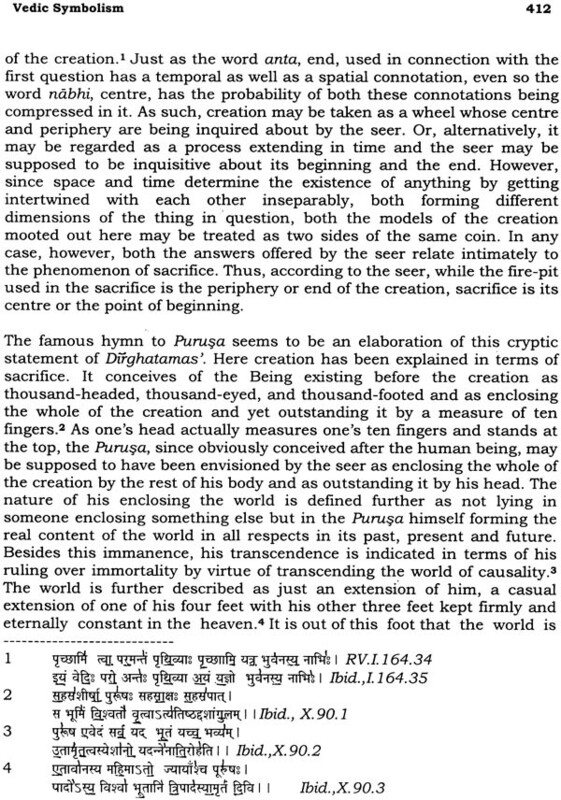 It may be added that this work, incidentally, knocks down practically the entire castle of the theory of Aryan Invasion by showing its total improbability on the textual ground while the close parallelism discovered between Rigveda 1.64.7-8 and the Pasupati Seal of Mohen-jo-daro deals a final death-blow to it besides confirming on archaeological evidence the necessity of symbolic interpretation of Vedic mantras. So is the consequence of Symbolic interpretation of the Dasarajna War. I feel very happy to welcome this important book, which can be considered to be a significant contribution of Maharshi Sandipani Rashtriya Veda Vidya Pratishthan to the cause of recovering the ancient spiritual knowledge of India which is now increasingly recognised to be of direct relevance to solution of the contemporary crisis from which humanity is passing today. After the publication of my Upanisadic Symbolism in 1981, I have been thinking all the time to work out the Vedic Symbolism, as the former was just a stepping stone to it. But the difficulties visualised in the way went on making me postpone the project under one pretext or the other. 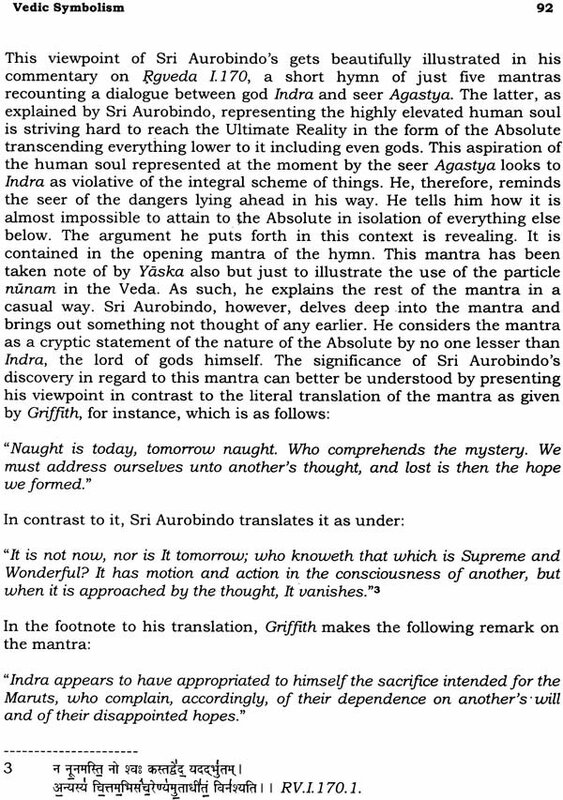 The background of the work, however, continued to be formed and affirmed so as to enable to reach a definite conclusion regarding the mode of expression of the Vedic seer. 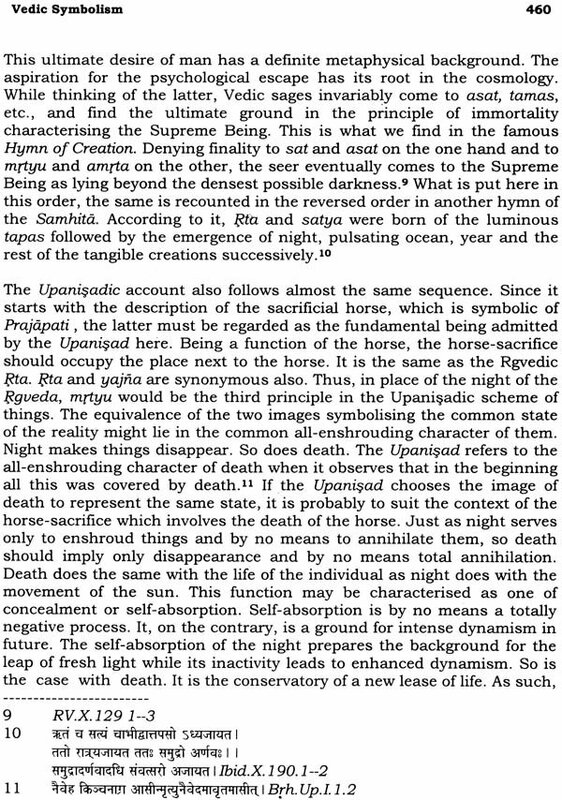 It is how I came down to April 1998, when Dr. Kireet Joshi, the real motivating force behind this work, asked me to deliver 30 lectures on Vedic Symbolism before a knowledgeable and interested audience comprising teachers and research scholars drawn from the Universities of Delhi. The line of approach taken up here is simple and realistic. 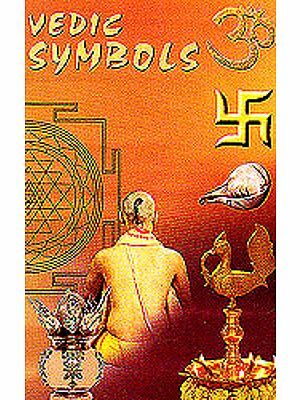 It is based on the universal psychology of formation of symbols which has already been explained in detail in the Upanisadic Symbolism. 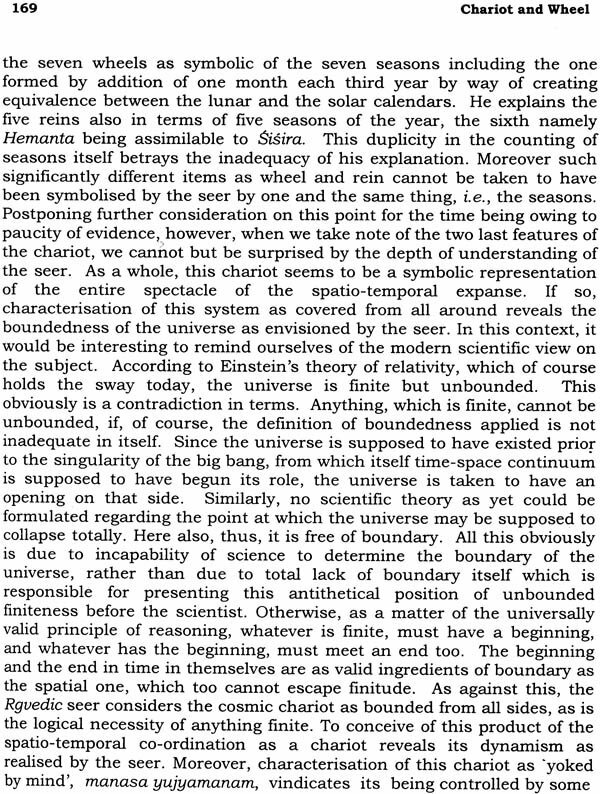 To restate the same summarily here, the process of symbol formation, no matter explicitly or implicitly, starts with the perception of the point of similarity and comparison between any set of two facts one fully known and the other known only partly but required to be known fully under a certain circumstance. This indeed forms the rock-bottom of understanding whatever. When the fact to be known happens to be precise, the analogue of it assumes the role of a sign such as it happens in the case of alphabets, numerals, indicators put up on waysides etc. On the other hand, when the fact happens to be complex, multidimensional, abstract and of somewhat strange nature, the thing emerging tentatively as its nearest analogue gets established, eventually in course of repeated usage, as its symbol. The process involved in the transformation of the casual analogue into a symbol may be illustrated by the steps underlying transformation of simile into metaphor. 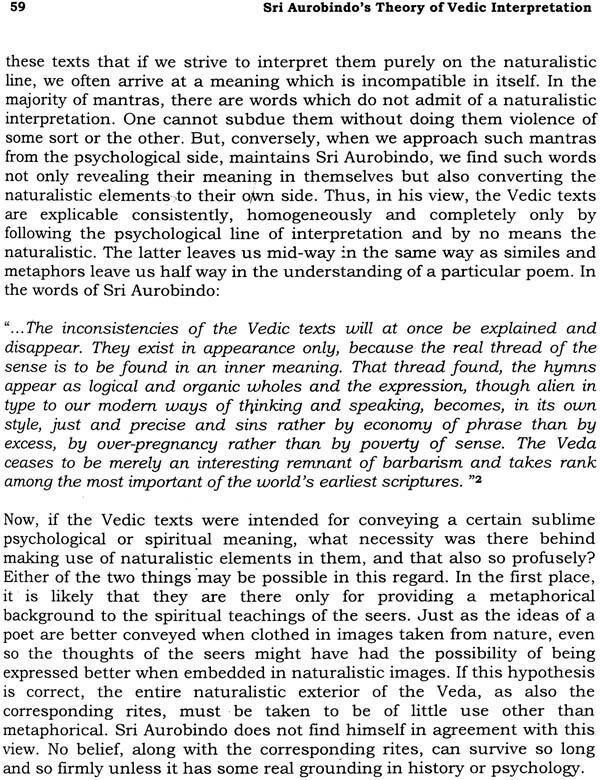 On this simple but fundamental assumption is based in these papers the understanding of the intangible in terms of the tangible in the Veda. Cow, calf, bull, milk, ghrta, horse, chariot, wheel, path, light, water, dawn, sun, ocean, night, day, mountain, cave, river, tree, fruit, foliage, bird, etc. are simple spectacles of nature in which the Vedic accounts abound. 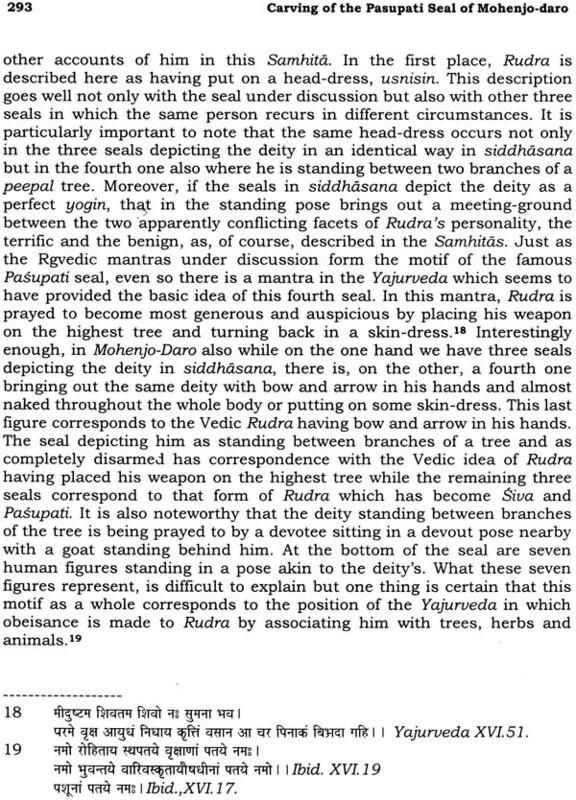 Naturally, they would have formed the environment of the Vedic seer. In his prayers, it was but natural for him to have made use of these spectacles. Now the crucial problem behind this usage is whether it is realistic or figurative. The decisive point between these two alternatives is the thoroughness in explaining the mantras concerned in either of these two ways. 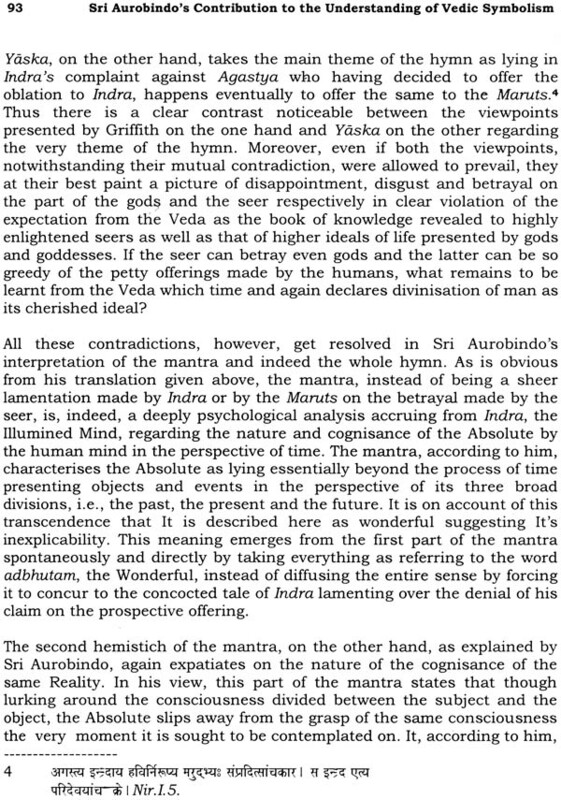 The point gets elucidated historically by the study of the Veda prosecuted at the initiative of Western Vedic scholars and having been kept continued for about the last two hundred years without being able to draw anything coherent out of the texts so venerably preserved and sought to be drawn upon in actual life since untold ages by a multitude of people in India and thus creating a cultural ethos remaining vibrant throughout the ages and having every prospect of leading the way in the future also. The dry beds of all other concurrent cultural streams world over doubtles.sly bear out the remarkable profundity of the source from which this cultural ethos has been flowing out. 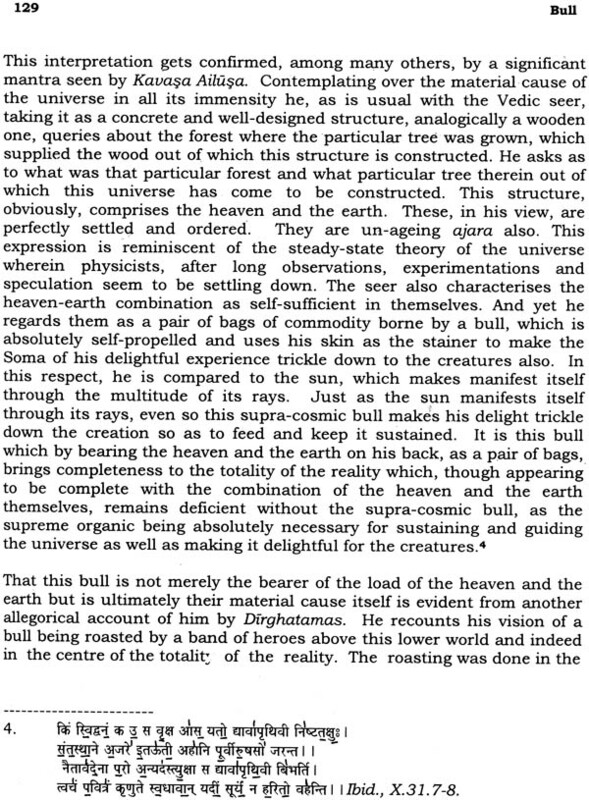 As such, how can that source be so shallow as to be a mere description of the natural scenario done by the bewildered mind of the primitive and ignorant? As against this hopeless state of things created by the realistic interpretation, the symbolic one, as followed partly by Yaska and the Upanishads and thoroughly by Sri Aurobindo, evinces the viability of explaining everything in the Veda coherently, systematically and as per its reputation throughout the ages. The venture of the year 1998 was kept continued in the next year also. Encouraged by the results of the first year as also enriched by the experience of the first series, I took up in the following year certain abstract ideas and practices such as initiation, tapas, yajna, vak, and pranava and examined them in their symbolic perspectives. Finally, these analyses led to exploration into the ventures of one of the most primeval Vedic seers, namely, Angiras who has been involved in a number of events recounted so picturesquely in the Veda. Analysis of these accounts on symbolic lines has resulted in deep penetration into the extraordinary method the seers applied in their search for knowledge. 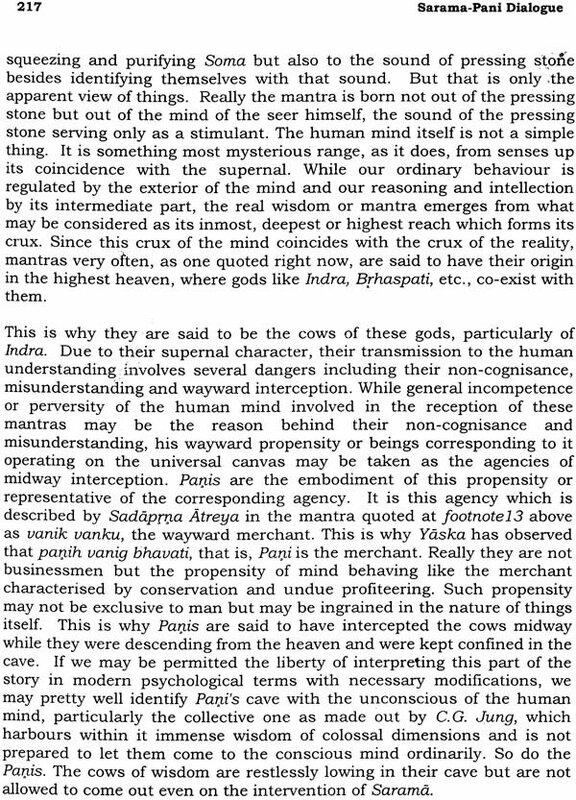 This analysis, I hope, has opened a systematic way to Vedic epistemology which is so vital for the understanding of the Veda after the demolition of the ill-designed castle of Aryan invasion and j.rimitive origin of the Vedic lore. It is with this conviction confirmed by decades of thinking and practical application that the present series of lectures is being brought out in print so as to attract the attention of more mature scholarship in the field to the problem concerned as also for further attestation of the solutions offered herewith. Coming to this end, I must acknowledge my sincere gratefulness to Dr. Kireet Joshi, the moving spirit behind this work, but for whose initiative it might have suffered postponement for all time to come. I also feel beholden to all the participants of the workshop whose articulate comments and suggestions and sometimes even sheer nodding of heads has been of immense value in the correction of my aberrations as well as confirmation of the line of approach taken up in this work. I cannot forget the services of Mr. Mukesh also who by means of his computer gave my shabby manuscripts a neat, clean and crisp form and so promptly as Lord Ganesh might have done in the case of the Mahabharata. I am also thankful to Mrs. Uma Chandrasekhar who is working as Research Assistant in our Centre for helping me in the preparation of the Index. Indeed, it is due to both Mr.Mukesh and Mrs.Uma Chandrasekhar that my manuscript has taken the shape of the present publication. I wish them all happiness in life for this signal service. Graphics used in the book are not of our own creations. They have been drawn from diverse sources to bear out some sort of semblance to the central ideas discussed here. I acknowledge my indebtedness to all those agencies responsible for the creation, production or reproduction, as the case may be, of these graphics.